It’s tiny. It’s cool looking. And it’s expensive. 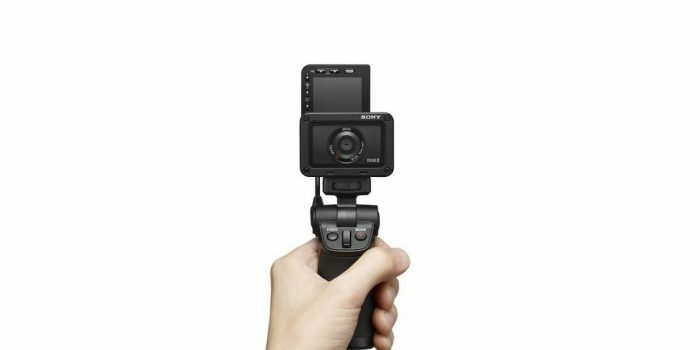 At $698 (USD) the Sony RX0 II is an action cam with a few neat tricks up its sleeve. For one it has a flip screen. That means you can see yourself as you compose shots, making it a suitable video camera option for Vloggers and YouTubers. Secondly, this is a very compact camera: 2.3 x 1.6 x 1.37 inches to be exact (think GoPro size). That means you can easily slip the RX0 II into a pocket or purse. And you’d barely notice too — weighing in at a featherweight 132 grams. Other features include much of what you’d expect from an action cam: 4K video recording (3840 x 2160 up to 30 fps and full HD up to 960 fps); 1-inch 15.3MP sensor; replaceable battery; 3-inch LCD display; SD card slot; mic input; HDMI output; waterproof and shock proof body; and in-body image stabilization. 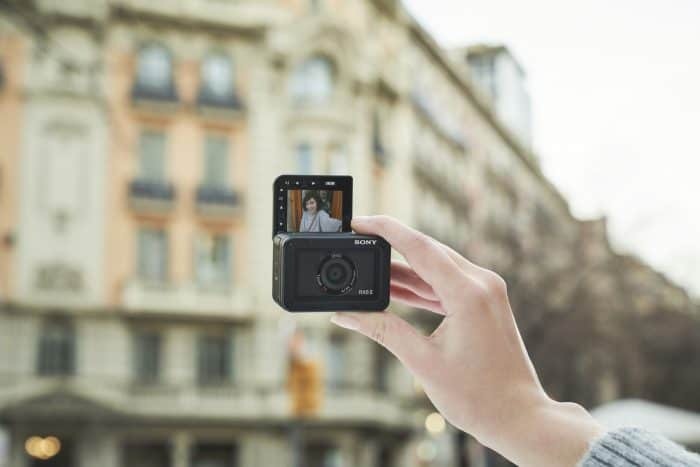 Sony RX0 II is a compact action cam that should appeal to YouTubers and Vloggers. 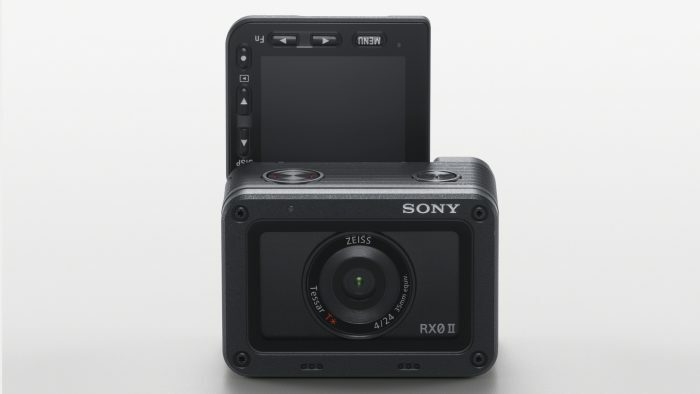 For those content creators and video producers looking for a compact camera that can take a beating and still record high quality 4K video on the go, the Sony RX0 II looks to be a compelling choice. One thing to keep in mind is the built-in lens. It’s ZEISS which is great. But it’s a wide angle 24mm at F4. 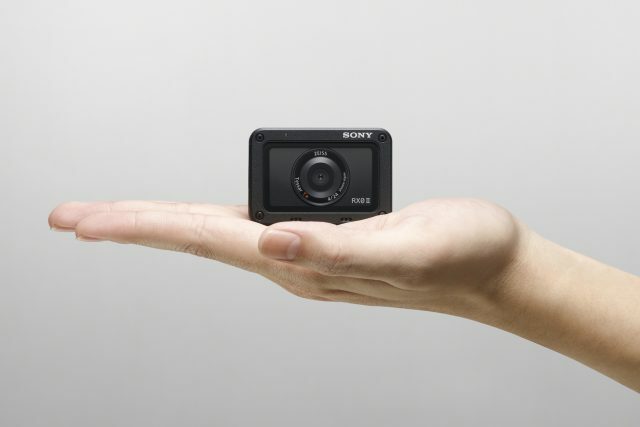 That’s great for wide shots and landscape and most of the kinds of applications you’ll use an action cam to shoot. 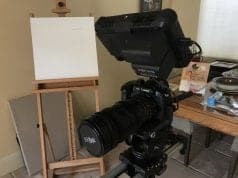 For close-ups, bokeh and other things you may want in your video you’ll likely prefer an interchangeable lens (ILE) camera instead (my #1 pick in this space remains the stellar Panasonic Lumix GH5 mirrorless camera). 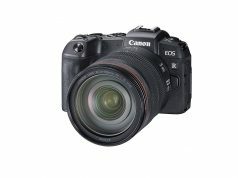 Also, at F4 the lens will be absolutely fine outdoors where there’s lots of light, but might not be so good in darker situations (where you’d want something like a F2.8 or F1.4 lens). One caveat for video shooters: battery life is rated at about 35 minutes. So load up on some extra batteries before heading on location. Odd product naming aside (RX0 ?? ), I’d say watch out GoPro. Sony says the RX0 II will ship April 2019 with a list price of $698 (USD).